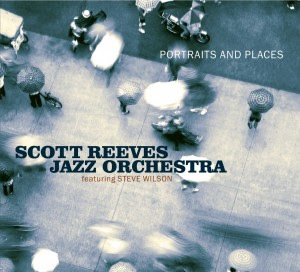 This CD, on the Seattle-based Origin label, is the debut recording of the New York-based big band led by trombonist/composer/arranger Scott Reeves. He has previously made albums as leader, but of smaller ensembles. The band has been in existence since 2008, the recording was made in early 2015, and the listener can hear clearly the considerable time, care and attention that has been spent rehearsing this music: the performances are as relaxed as they are accomplished. The opener, a tribute to the late pianist and educator James Williams, features Reeves on the rarely-heard alto flugelhorn and the first of several excellent piano solos from Jim Ridl. All tunes bar one are Reeves originals. 3 'n 2 demonstrates his ability to weave strong themes, rich harmony and improvisation over a seemingly unstoppable groove. The first time we hear Sara Serpa's voice is her wordless vocal on Osaka June. She floats over the ensemble adding perfectly intonated warmth and sofness. Whilst the next number Waters of March / Águas de março was composed by Antonio Carlos Jobim in 1972, Reeves has made it his own, retaining the lilting bossa feel but demonstrating his skill as an arranger in almost ten minutes of development and invention. The centrepiece of the album is the L & T Suite which weaves themes from four twentieth century composers with Reeves' own invention, and each movement features a particular soloist. Saxophonist Steve Wilson is up first on Wants To Dance, crafting an exciting alto solo between tricky opening and closing ensemble sections. Next Matt McDonald tells A Trombonist's Tale quite beautifully. The suite closes with the exuberant Hip Kitty which once again features Ridl's pianistic artistry. Finally there's one Last Call, a soulful blues notable for solos from the bass trombone of Max Seigel and Terry Goss's baritone. This group of fabulous musicians are continuing and developing the great tradition of big band music. In the sleeve notes Reeves thanks several well-known and respected writers who have mentored and inspired him, including Manny Albam, Mike Abene and Jim McNeely. From the evidence of this recording, it seems clear that he should be considered as being on a par with them. I can honestly say this is one of the most enjoyable albums I have heard in recent years. Lovely charts, great playing and first-class recording.